I have NEVER been afraid of the police. Sure, the names that made national headlines are etched into my brain like lyrics to my favorite song: Sean Bell. Oscar Grant. Ronald Madison. James Brisette. Eric Gardner. Then there are the ones who did not make headlines continuously on CNN, MSNBC or FOX: Steven Eugene Washington. Stephon Watts. Remarley Graham. Manuel Loggins, Jr. Rekia Boyd. Kimani Gray. Kendrec McDade. Timothy Russell. Malissa Williams. Orlando Barlow. Wendell Allen. Alonzo Ashley. Aaron Campbell. All black, mostly teenagers or young men in their early 20s. All killed by cops, mostly white. All unarmed. Oh and let’s not forget Rodney King. I am afraid for my 20-year-old cousin. I am afraid for his friends. I am afraid for my nephews. I am afraid for my friends. I am afraid for their children. I am afraid for all young boys and men who have to check the Black/African-American box when identifying themselves on documents. In my lifetime, I have met a lot of great police officers. I have met police officers who willingly do welfare checks. I have met police officers who stop and talk to kids on the streets about grades and being good citizens in their communities. I have met police officers who help chase down animals who have escaped from their homes. I have met police officers who are more than willing to do whatever is necessary to keep the peace, without using excessive force. I have met police officers who have wept openly over a fallen comrade as well as strangers in the community. I have met police officers who epitomize what it means to be a police officer: to protect and serve the community. In 2003, I met a police officer whom I trust with my life. Over the years he has proven to be consistent, reliable, dependable, honest and loyal. I believe there is more good in the world than bad. I believe there are more good cops in the world than there are bad ones. I believe most cops take the oath of honor with the intentions of protecting and serving those in their community. I know good police officers in my hometown who I see diligently working to protect our streets. Personally, I have never had a bad experience with a police officer. I have NEVER been afraid to trust the police. I have NEVER been afraid of the police. In February 1999, the story disturbed me. Amadou Diallo, an unarmed black man, was shot 19 times by four police officers who fired off 41 rounds. My 17-year-old mind sought understanding. As a news junkie, I thought I could find it there. I was wrong. As a newspaper junkie, I thought I could find it there. I was wrong. As my mother’s only child, I thought I could turn to her and find what I was seeking. I was wrong. It then dawned on me. There was no understanding. It would never make sense. It was senseless and yet at no point in time did this act of violence change my view of the police. I was not afraid of them. 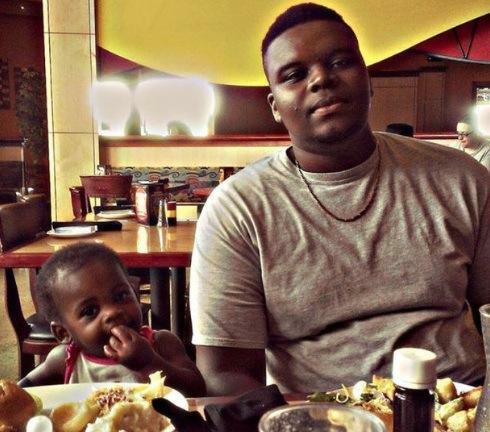 What happened to Michael Brown was disgusting. Hateful. Sickening. Barbaric. Cruel. Heinous. Yeah, we do not have all the “facts” as of now but we know enough. We know that a young UNARMED black man was gunned down like a wild animal in the woods. Only his forest was the middle of the road in an apartment complex and his hunters put their hand on a Bible and swore to protect him. I see it on social media all the time. Friends of mine, who are black, sharing the warnings they have been given over the years by their fathers, grandfathers, uncles, brothers, cousins, etc. about how to handle contact with the police. They have been told to do nothing that would warrant the police having to restrain them, apprehend them or confront them. My friends, in turn, have passed these messages along to their sons. The warning flashes like emergency lights: police officers cannot be trusted. I would often chime in with my thoughts that were often filled with a defense of police officers because I believe the majority are not bad. As a devout Christian, I cringe when I type those words. I have never been afraid of anything other than snakes. Oddly enough, that is what many equate police officers to be. The more I write the more I realize that I am not necessarily afraid of the police but more so afraid of the power they have. Of all the names mentioned in the beginning, police officers were only held accountable in two of the murders. This accountability included actual jail time that amounted to a little over five years. FIVE YEARS. I am afraid of the fact that there are police officers out here who without hesitation will open fire on young black men like it is duck season. I am afraid that there are police officers who willingly take this course of action because they know it is highly unlikely that they will have to pay for the crime. I am afraid that there are police departments, like the one in St. Louis County, MO, who treat peaceful, protesting citizens like public enemy number one. I have NEVER been afraid of the power of the police. Even as my words change, the thought still upsets me. The words perpetuate a stereotype. In my hometown, we have never had an incident even remotely similar to what we have seen take place in Ferguson, MO and I am positive I have hundreds of friends that can say the same about their hometowns. Being afraid of their power is no different from a white person being afraid of all young black men because of what they see on tv. It is no different from a black person thinking all white people are racist. It is no different from Americans thinking all Latinos are in the country illegally. These are generalizations and they are ones that are proven everyday to not be true. As much as I want to believe a situation like this will not happen close to home, sadly there is no guarantee. As I stated before, I am a Christian. My defense against my friends in the past when they expressed their feelings about being Black in America was that I trust GOD. I refuse to worry and stress about what ifs. HE is my protector, provider and shield. If I have to worry daily about who and what is out and about then I might as well stay inside. I cannot live a life of fear. That is not how I was designed. The reality is that while I believe most police officers have good hearts and would not shoot an unarmed young black man, I do not know which police officers fall into this category. The officers I know do but what about the officer that passes me on Interstate 85? What about the officer I encounter at a football game? What about the officer that is passing through town? What about the officer that is off duty and is shopping at the mall? What about the plain clothes officer who is patrolling the streets blending in with civilians? What about the officer that is called to quiet a disturbance? How do I know these officers do not belong to the same trigger happy tribe that we have seen rear its ugly head from coast to coast? The fact is, I do not know. And that is unsettling. I have NEVER had these types of thoughts running through my head. I have NEVER been this concerned about every day encounters with police officers. I have NEVER prayed so hard for the hearts of police officers all across the country.